Our blog posts in 2013 were rare for several reasons. While some of those reasons might not pass scrutiny, the fact that we are now cycling more than ever is certainly true. In 2013, both of us purchased road bikes and did our best to ride* multiple times a week. 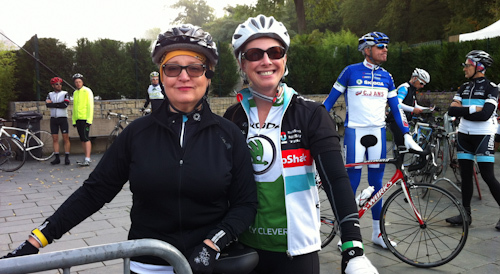 In September, I did my first organized ride with my friend Amanda. The ride was sponsored by the Schleck Fan Club and it was a wonderful day. Amanda and I had a terrific time, even though we weren’t the strongest riders participating. No matter, the fan club made the day great for everyone. When I saw that the new UCI team Trek Factory Racing was having a fan club ride in January, I was terribly excited. Will and I are big fans of the new team and big fans of the Classics races. How much fun would it be to do a small part of the Ronde van Vlaanderen? Will expressed doubt: our fitness level wasn’t there and we weren’t ready for something like this. Nonsense! I replied. This is a fan club ride. I’ve done a fan club ride! We’ll just take our time and have fun. We’re there to make memories, not win a race. With much skepticism, Will agreed to support me on this adventure. We bought our tickets and looked forward to January 10, the day of the ride. The morning before the ride was beautiful. 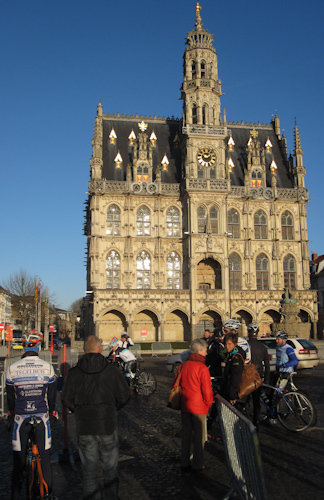 The weather in January in Belgium could be terrible, but we were graced with sunshine and warmth. 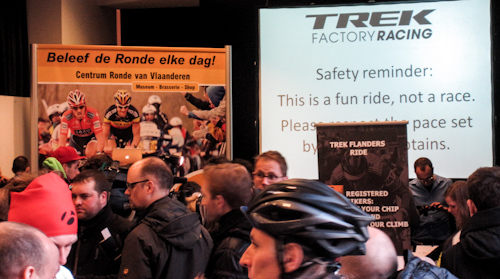 We gathered up our gear and out bikes and headed to the start at the Ronde van Vlaanderen museum. 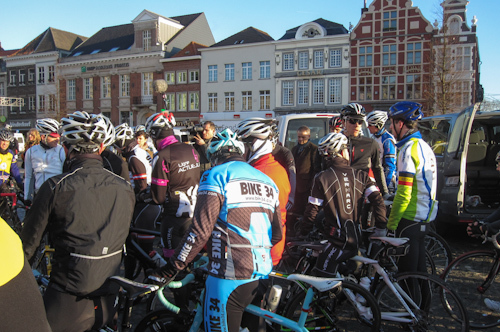 Before the start, there was some time with the famous riders, having coffee and snacks. Everything looking like it would be a great day, until the host started giving us instructions for the day. As we arrived that morning, we had been asked what start time we wanted. 10 a.m. was already full, but 10:15 and 10:30 were left. I selected 10:15, since that would allow us as much time to finish as possible. We had a commitment later in the day, so we had to finish the ride in less than 4.5 hours. The host explained that there would be guides on the ride. Those guides would make sure that we stayed with our group and they would make the group wait on the last people at different points in the ride. My stomach dropped at this announcement. This was entirely different than the Schleck ride, where Amanda and I were able to go at our own pace. It was at this point I began to think that maybe I had taken on more than I was capable of. When I mentioned that to Will, I got the silent look that said, “I told you this was a bad idea.” But here we were – we might as well try and do our best. Our group gathered for the start. The first part of the ride was a long, flat path. We clicked into our clipless pedals and weaved through a little traffic to get to the path along the river. Five hundred meters done, only 68 thousand more to go! Editor’s note: Look for Part 2 on Wednesday. This was such a big event for us that it will take three posts to get to the finish line! * We spent two years in Ireland. Every time I type “ride,” I cringe. But it is a very common term for Americans. Enjoy your giggles, my Irish friends. omg!! how many posts? i’m okay with long posts!! way to leave me hanging! !